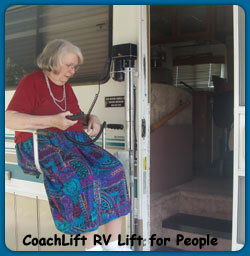 Coachlift offers RV person lifts to help people with limited mobility get in and out of their RV's. I think it's a great product. My Mom has suffered from diminishing mobility the last several years which has made it difficult for her to go places. Until I saw her unable to walk up steps I didn't realize how difficult getting around can be for people with mobility problems. Even one short step can be a big issue for someone with knee or hip problems. Last year my Mom couldn't go to a family wedding reception because the restaurant didn't have handicap access and there was no way she could get up the 5 steps into the restaurant, even with help. And, if it wasn't for the chair lift we had installed at her house last year, she wouldn't be able to continue living there. So I was really happy when I saw these RV lifts while browsing through a camping magazine today. RV lifts allow couples to enjoy the RV lifestyle even if one, or both, of them has problems navigating steps. My back, hips, and knees are all in good shape and I think the steps in and out of RV's are pretty treacherous at times. One great thing about the RV lift I have pictured here is that widening the door of the RV isn't required. According to the company's web site, "It [the lift] is installed on the exterior of the RV next to the entrance door. The user sits on the lift chair, pushes the hand-held control button, rises gently on the vertical lift tube, and swings the chair through the door opening into the interior of the RV. The double-hinged design of the swing arm allows the durable aluminum chair to turn to any angle for easy loading. The lift is used the RV's accessorty battery for its power. When it's time to hit the road, the chair and swing arm of the lift are easily removed for stowing inside the RV. For more information, check out CoachLift's website.